When it comes to wedding planning there is so much to think about the venue, the cake, the dress and the guest list. When planning a wedding people often like to choice a colour scheme to use for their special day. If you’re a bride to be and are planning your special day and are not sure what colour to choose for you wedding do not panic as there is a new pantone colour of 2018. 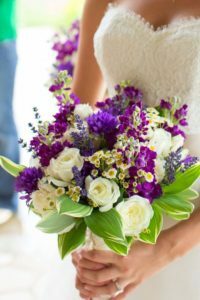 2018 is the year for ultra violet, so your search for a colour scheme is over, whether you want to inject a hint of the colour into your special day or go all out and have the whole wedding purple, we have some ideas to give you some inspiration. If you want to use ultra violet at your wedding but you’re unsure on how to use it or only want to use a hint of it at your wedding using it on your invites might be just for you. 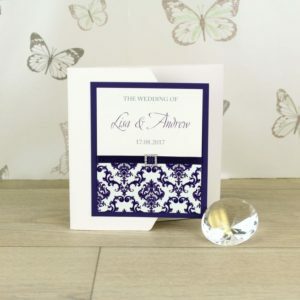 By choosing to do your invitation you can either use a simple invite with a splash of the colour or go all out by using an invite such as the platinum pocket fold wedding day invitation. Fall in love with the Platinum day wedding invitation. 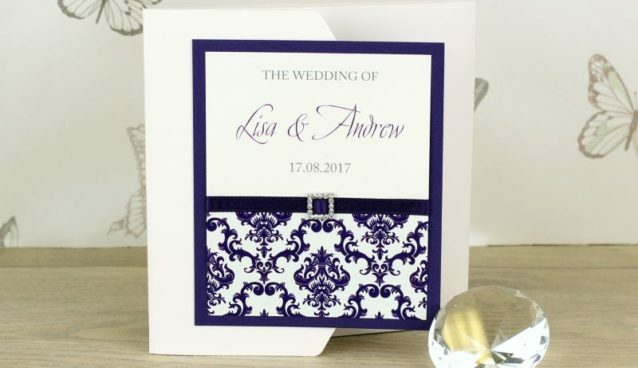 To add the colour to your day why not opt to use the colour for your accessories, you can do this by choosing a few things to make purple on your day such as cake topper, guest book or this Imogen Post box where guest can post cards on your special day. You can order the Imogen post box online. Another way to insert the colour into your day is by injecting the colour onto your cake. 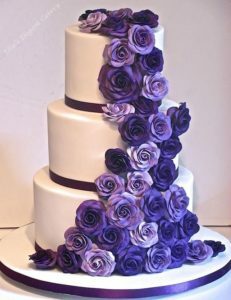 You can do this by either jazzing up a simple white cake or by making a bold statement at your wedding and having a complete purple wedding cake. This could bring some colour to your venue and will not only add a little something to the room but will also be delicious to eat. You can use the new pantone colour to decorate your chosen venue, often people add colour to a room by making the table cloths their chosen colour. 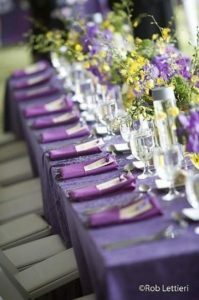 If you want to use white table cloths but still want to use ultra violet on your day, you could also consider using the colour for your centre pieces instead. Our collection of wedding accessories are perfect for decorating the venue. Why not use this year’s new pantone colour for your bridesmaids and groomsmen outfits. 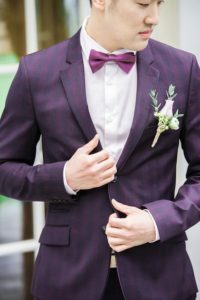 You can go big and bold by making the bridesmaid wear purple dresses and the groomsmen wear purple suits or you could just give an acknowledgment to it by having hints of purple incorporate into their outfit through accessories such as jewellery for the bridesmaids and ties for the groomsmen. If your plan for your dream wedding is have it very simple and use neutral colours but have decided to add a splash of colour, a way for you to add the colour is just by making the flowers your chosen feature. This will still keep your day simple and the colour not to noticeable but will still add a little something. Share Your Ultra Violet Themed Wedding Inspiration With Us! If you decide to use this year’s pantone colour let us know in the comments how you used it within your wedding.